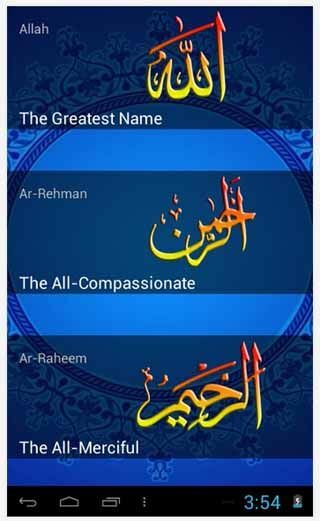 Free download latest version 99 Names of Allah AsmaUlHusna for Android with APK file. Prophet Muhammad (PBUH) said, There are 99 names of Allah, and that anyone who memorizes all the names will be awarded paradise. Finally an app that helps you to learn and memorize the 99 names of Allah. The amazement does not stop there this app also helps you remember the meanings of each name of Allah. The 99 names of Allah are called ‘Asma Ul Husna’ (Pronounce Asma Al Husna) which in Arabic means ‘The Most Beautiful Names’. These islamic names are attributes of Allah SWT by which Muslims regard God in Islam. In Arabic, the word Allah means ‘The God’. It is derived from the union of the word ‘Al’ meaning ‘The’ and ‘Ilah’ Meaning ‘God’. The word Allah is the supreme and all comprehensive divine name. In Islam, the name Allah is unique and unmatched and indicates the existence of one creator of the universe. Prophet Muhammad’s (PBUH) life, traditions and his Islamic lectures (Sunnah of prophet Muhammad) are of great significance & Muslims follow his traditions all over the world. 99 names of Allah are written in English and Arabic along with the meanings of each name in Arabic, English and Urdu. Install this android app today to get Asma ul husna, the beautiful names and attributes of Almighty Allah in English and Arabic along with the meanings of the names. Recite or memorize the 99 names of Allah any time any where from your phone. 99 Allah Names(Asma Ul Husna) in English. 99 Allah Names(Asma Ul Husna) in Urdu/Arabic. For each name of Allah, a short English translation of Quranic-meaning is provided. Detailed meaning of each name is also provide within the app. Asmaul Husna with synchronized audio for most names. Completely Offline Islamic God names and meaning App! No internet connection required to use this Islamic app after its first download. Quiz/Test – Test yourself to see how well your doing memorizing Allah’s names. FREE app. No cost or purchases required. Just download for FREE today, for use during Islamic prayer times – Adhan / Salaah. We have tried our best to provide the most accurate information within the smallest possible size for android phones. This pro app is completely Offline and FREE!! We are dedicating this to all Muslims and non-Muslims alike to understand & learn about Islam, in hope to spread the knowledge of Islam. This is an Ad-supported version. Support the developer of this app with your positive feedback & good ratings, so that we can bring to you more quality Islamic apps for FREE on demand. Thank you for your support.